***NEW HOME*** Built by Orion Homes is this superbly appointed and attractive three bedroom semi-detached family home boasting accommodation over three levels. This property is available for purchase on a shared ownership basis; from 40% share at £91,980 with a monthly rent of £316.18 up to 75% at £172,463. EPC rating B83. ***NEW HOME*** Built by Orion Homes is this superbly appointed and attractive three bedroom semi-detached family home boasting spacious accommodation over three levels with gas central heating and UPVC double glazing. 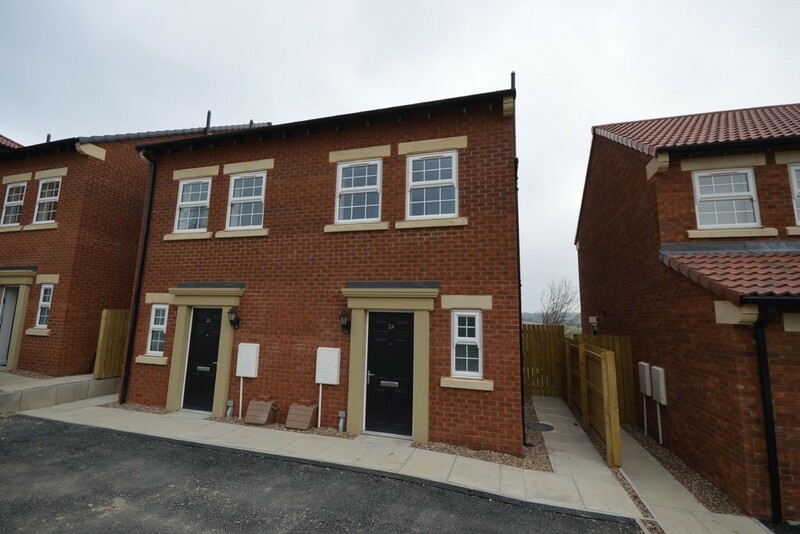 This property is available for purchase on a shared ownership basis; from 40% share at £91,980 with a monthly rent of £316.18 up to 75% at £172,463 plus a monthly rent of £131.74 with the option to purchase the remaining lease after completion, in which case the purchaser would own the freehold and the lease against the property is terminated (subject to terms & conditions). Legal fees paid (up to £1000) subject to terms and conditions. The accommodation briefly comprises entrance hall, downstairs w.c. and superb open plan kitchen/dining/living room. The first floor landing leads to two double bedrooms and the shower room/w.c. which can also be access from bedroom two, whilst to the second floor is the large master bedroom with bathroom/w.c. Outside, a driveway provides off street parking to the front, whilst to the rear, there is a lawned garden. Situated within the popular area of Wrenthorpe, the property is well placed for access to local amenities including shops, schools and local bus routes nearby. Good access to the motorway network for those wishing to commute further afield. A superb home for the growing family, offered for sale with no upward chain involved, immediate vacant possession upon completion and having a ten year NHBC certificate. A full internal inspection comes highly recommended to avoid any disappointment. ENTRANCE HALL Composite front entrance door leading into the entrance hall. 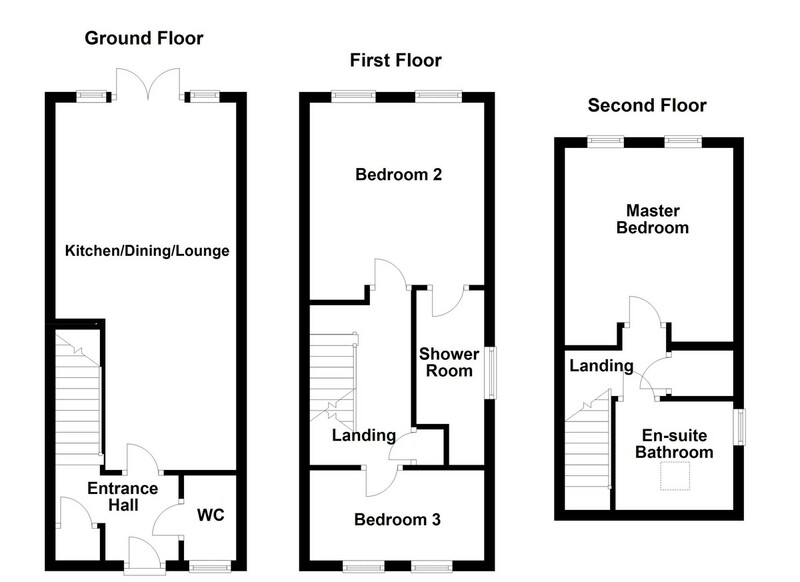 Central heating radiator, staircase to the first floor landing, storage cupboard and doors to the downstairs w.c. and open plan kitchen/dining/living room. DOWNSTAIRS W.C. 3' 3" x 5' 3" (1.01m x 1.61m) Low flush w.c. and pedestal wash basin with tiled splash back. UPVC double glazed frosted window to the front, central heating radiator and tiled floor. KITCHEN/DINING/LIVING ROOM 25' 2" x 11' 2" (7.69m x 3.41m) max The kitchen comprising a range of contemporary wall and base units with complementary work surface over incorporating 1.5 stainless steel sink and drainer. Integrated Bosch oven and grill, Bosch stainless steel four ring gas hob with cooker hood above, tiled splash back, space for a fridge/freezer, plumbing for a washing machine and tiled floor to the kitchen area. Three central heating radiators, UPVC double glazed French doors to the rear garden with glazed side screens. FIRST FLOOR LANDING Doors to two bedrooms and the house bathroom/w.c. Central heating radiator, storage cupboard and staircase to the second floor landing. BEDROOM TWO 11' 3" x 11' 11" (3.43m x 3.65m) Two UPVC double glazed windows to the rear enjoying views over fields and adjoining countryside, central heating radiator and access to the shower room/w.c. BEDROOM THREE 6' 10" x 11' 1" (2.10m x 3.40m) max Two UPVC double glazed windows to the front and central heating radiator. SHOWER ROOM/W.C. 4' 6" x 10' 11" (1.38m x 3.35m) into shower Three piece suite comprising shower cubicle, low flush w.c. and pedestal wash basin. Part tiled walls, tiled floor, UPVC double glazed frosted window to the side, inset spotlights to the ceiling and towel radiator. Can be accessed from the landing and bedroom two. SECOND FLOOR LANDING Loft access, boiler cupboard/store and doors to the master bedroom and bathroom/w.c. MASTER BEDROOM 12' 4" x 11' 3" (3.76m x 3.43m) max Two UPVC double glazed windows to the rear taking advantage of the views over fields and adjoining countryside. Central heating radiator. BATHROOM/W.C. 7' 9" x 7' 9" (2.38m x 2.37m) Three piece suite comprising panelled bath, low flush w.c. and pedestal wash basin. Part tiled walls, tiled floor, towel radiator, UPVC double glazed frosted window to the side and double glazed Velux style skylight window. OUTSIDE A tarmacadam driveway provides off street parking to the front, whilst to the rear there is a lawned garden. LEASEHOLD The remaining term of the lease is 124 years (2019). A copy of the lease is held on our file at the Wakefield office. PLEASE NOTE A reservation fee of £200 will be required (payable to Leeds Federated Housing Association) which will go towards the final completion monies on the date of legal completion. There is also £1000 incentive towards legal fees. Terms & conditions apply.